Food Frontline (FFL) is a card collecting game focused on weight gain and food stuffing. Command, build and train your desired stuffing champions, arrange them into deadly squads, and defeat the endless horde of self-replicating foods to save the world! FFL is inspired by Eat the Dungeon and Girls’f Frontline, combining fun WG mechanics and animations with the ability to arrange squads and move them strategically in larger maps. The prototype is very bare bones right now. Timers can be bypassed in the future with mini games (playing a belly rub mini game to increase recovery rate, cooking mini game for crafting drops…). Anyway, if you have some free time, try it and give me some inputs. What mechanics do you want, what kind of doll designs or enemies should I add? PS: Can I have some feedback on whether you enjoyed the game? May I have some head pats for a job well done? Aside from the ridiculous load times, this has very good potential. It takes longer as the game goes on, at most minutes, first session died on me before I could get into combat. edit: second session died after first combat. ohhh by session do you mean the doll recovery times? does it crash, or just freezes? Mostly freezes, crashed the first play session. I really liked this game it reminds me of a game called legend urban I think that name. I hope it has more updates because I love it. Can you tell me briefly what you where doing (buttons pressed, which mission,. …) when the game froze? first mission, wasn’t pressing a single button during the combat, and it just froze after the battle was over. Google Chrome. I doubt that the browser is the issue, though I wouldn’t be surprised if it was. Freezes/crashes in Chrome for me as well, but runs fine in Edge. Can you describe to me what actions took place before the game froze? Also what OS are you running? can i play it on android? This is a really cool concept, and I can definitely see the inspiration from Eat the Dungeon. The story behind it is really unique and one of this game’s strongest points. You have a great foundation for it being “very bare bones” as you said. The gameplay is quite enjoyable, if not a tad hands-free. It feels a lot like a mobile game or Facebook game, but it doesn’t have the annoying energy-based thing that a lot of those types of games have. For improvements, it’s hard to say exactly what could be improved on, since chances are most of what I do have to say here are already on their way to being improved. That being said, the weight gain feels a little… off. Like, they almost exclusively gain it in their stomachs even when they’re not full (though I did notice the bit that was added to their face which was a nice touch). Having it spread out more would greatly benefit the game. Or having each doll gain it in different ways (I could see Aria (I think that was her name… the starting doll) being all-around in terms of gain, whereas Rosa feels like one who would be more like hourglassy with a small potbelly to me, for example) (and don’t feel obligated to follow the part in parentheses, as that was just what I pictured for them - you may have other ideas that would work just as well or better and I wouldn’t want to be the reason that changes). Also, while the gameplay was enjoyable overall, I also felt it wasn’t really involved enough. It kind of felt like I just clicked to start a level and it was all done for me. Now if I remember correctly, there are things I can do as a player besides just sit back and watch, but it was all done well enough that I really didn’t feel like I had a reason to do anything. 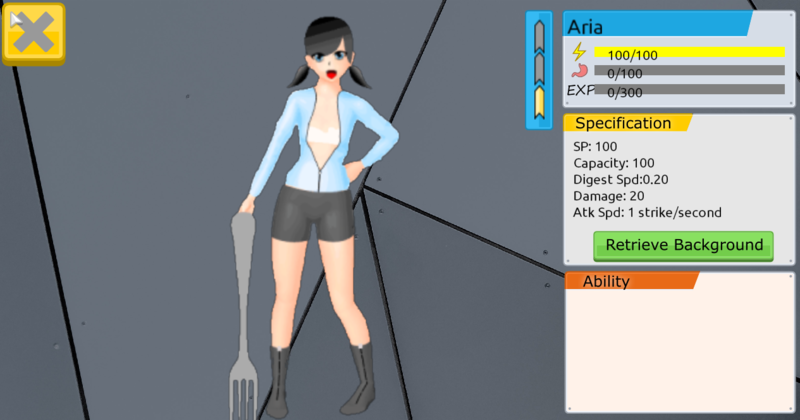 Making the food more difficult to (b)eat or the recovery cost money would be a great way to incentivize using the combat to its full potential if you wanted this to be the way combat works in the finished project. If not, then I anxiously await what you have in mind for it instead. All-in-all, this is a fantastic start! I look forward to playing this game more as it progresses! EDIT: One more thing I forgot to mention! It would be cool if each doll had their own strengths. I mean, Rosa seemed to have a Spicy resistance from my own experience, but it was unclear what exactly that meant. Having more clear-cut and pronounced differences between dolls is something I feel would be a nice improvement. As the self-proclaimed chief playtester, I know slightly more than the average joe about FFL and planned features. Most dolls that have been made already have this same general shape, but I’m sure later girls could have more varied shapes. As I’m quite partial to the current status quo, I hadn’t really thought too hard about it though. It’s a good idea, to be sure. Dolls are planned to be more diverse in their attack speed/strength/etc, as well as some dolls later being much better at dealing with certain enemy types, including things like spice resistance.